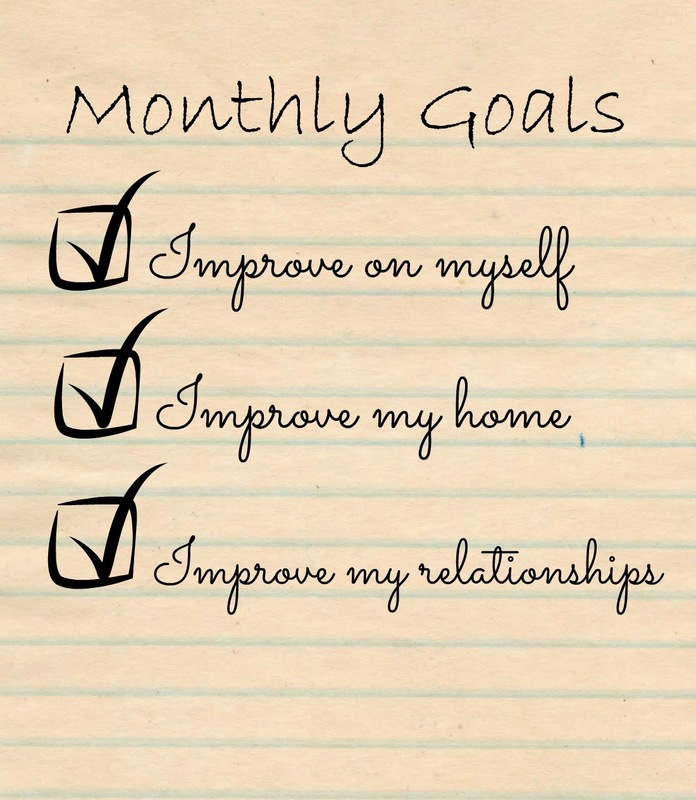 My goals will revolve around improving myself, my appearance as well as the inner me. Improving my home, organization and structure, and improving my relationships with my family and friends! There could be some other random goals, but for the most part these are the ideas that I will be modeling my goals after. 1. Send letters with pictures to family - The kids pictures are piling up and I want to send some notes to great grandparents and some aunts and uncles with updated pictures of the kids, along with some thank you cards from Christmas! 2. Organize my photos - My digital photos are a mess! I have no organization when it comes to the pictures and I need to make a plan and begin working on organizing them! 3. Have friends for dinner - We had such a great time when we invited some friends to our house for dinner and I want to do it again this month. Sometimes I feel like our house is not good for hosting, it is so small and can be chaotic when you add more kids, but I decided to invite people anyway, and it was great. So I am getting over my self consciousness about our house and doing it again this month! 4. Schedule play dates for Olivia and Owen - Olivia goes on all kinds of play dates, but I forget, sometimes, to have her invite her friends over, especially in the winter. 5. Work on making my blog "prettier" - I have already started changing the look of my blog and I am really liking the simple look of it! I am going to continue to work on it this month! 6. Fitbit goal 10,000 steps 5 days/week - I haven't been wearing my fitbit, but it is time to put it back on! Yes, we have tons of snow, but it is no excuse because we have a treadmill in the basement and I have a friend willing to go walk the mall with me. So, 5 days/week I am going to try for 10,000 steps! 7. Read 2 Books - I have been doing a lot more reading lately, and thanks to my book group, I have been reading stuff I wouldn't normally pick to read. I am expanding my book reading horizons, you could say! My goal for the year is to read 28 books. So at least 2 books each month with a few extra thrown in! Be on the lookout for my first book review on the blog this month! I have read some great ones lately! 8. Restart Jesus calling - I love this book, when I read it. I got this book last year and I loved to start or end my day with a passage, but I was never consistent with it and finally the last few months of last year, never picked it up. This year I would like to bring myself closer to God and one way is to give myself time to connect with him each day. Hence, starting this book again! 9. Schedule my days for better time management - I am all over the place people, I am busy, but often feel like I didn't accomplish anything. Anyone else feel that? I need to get a consistent schedule going for things I do every day. A routine, so that things get done when they should in a timely manner and then I can move on to other things on my list. During the week, my day is going to start and end at the same time, and there will be a schedule for what needs to get accomplished each day! That's what I will be working on this month, what about you?? Come on Back tomorrow for WIAW! It definitely helps to have the visual! Thanks for stopping by! Thanks! I know day to day life can get hectic and the fun stuff, gets pushed to the side! This list has been a great reminder to do those things! Thanks for stopping by! I love making goal lists! I do them a lot! Have you ever heard of Project Life!? look It up if you haven't! It's the best & easiest way I have found of keeping our pictures organized! There is a physical, digital or an app! I love the app!! I can put together a scrapbook page on it in 20 minutes!! I will definitely be checking that out! Thanks so much for the recommendation! I LOVE LOVE LOVE making lists!!! It's my most favorite thing to do, but it does bring occasional stress and disappointment too! ;) Thanks for sharing! Time management is something I am working on too. Once I get home from work the night gets away from me just because I start watching TV. Lists would definitely be helpful. Good luck with your goals! I am the same way in the evening. I am done at the end of the day, I just want to veg out! Hoping the lists and small goals will work! Thanks for stopping by! If you figure out a good way to organize your digital photos, let me know! I use Dropbox which is great because it's storage up in the cloud, but I have a not so great (and redundant system) for organizing the photos in Dropbox -- I store by date, and sometimes I want to find all my photos about say, "hiking in Colorado" and there is NO easy way for me to do that search! Right now I am just storing my photos right on my computer, so I definitely have to check out the few other options people have mentioned! On my computer they are organized by date I upload them. Worst. System. Ever. Anything will be an improvement over this!! I will keep you updated, if I find something that works!! You really accomplished a lot in January! Time management is my nemesis haha. That's a goal I have this year, but I did a terrible job of it in January.